This is a very long overdue post but for my mums birthday I made her homemade gift package. 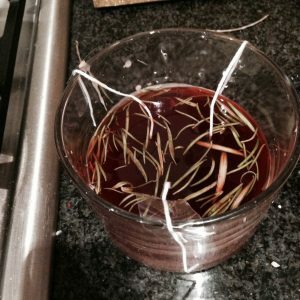 I’ve already posted about the DIY rosemary soap that I made for her, and here is another little treat that I added in. 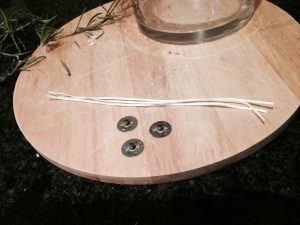 I always get really annoyed at the amount of wax left over when a candle is finished, it seems like such a waste so when I found this great method for making your own candles using the leftover pieces of waxI was really excited! 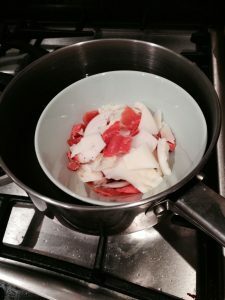 It’s a fab way to save on waste and its really simple and quick to do! You want to get the candle holder ready so that you’re not rushing around in the middle of trying to melt wax. First things first, add in the wicks and sustainers. It’s up to you how many you choose to add in but seen as my candle holder was quite big I went for three. Plus when you add more in I think you get less waste at the end as it seems to cover more of an area! 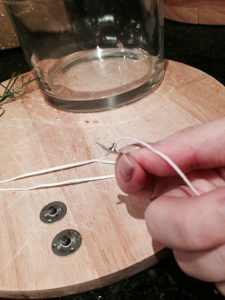 Cut each wick down to about the height of the candle holder plus a little bit more to allow you to hold it in place while your pour the wax in. (Last thing you want is the wick to fall into the boiling hot wax and get lost forever! Pop the end of each wick through a sustainer and use plyers or tweezers to squeeze the sustainer tips closed – securing the wick. Place each sustainer into the candle holder where you’d like them to be positioned and then I simply used cello-tape to hold the wicks out of the way. Next break the wax into small pieces, this will make it melt quicker and have more of an even consistency. Then pop the wax into a bowl and pop that in a saucepan of water. 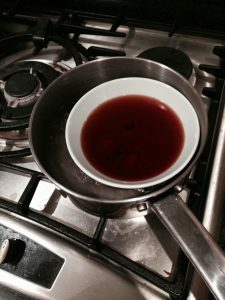 Bring the water to a boil and slowly stir the wax while it melts. 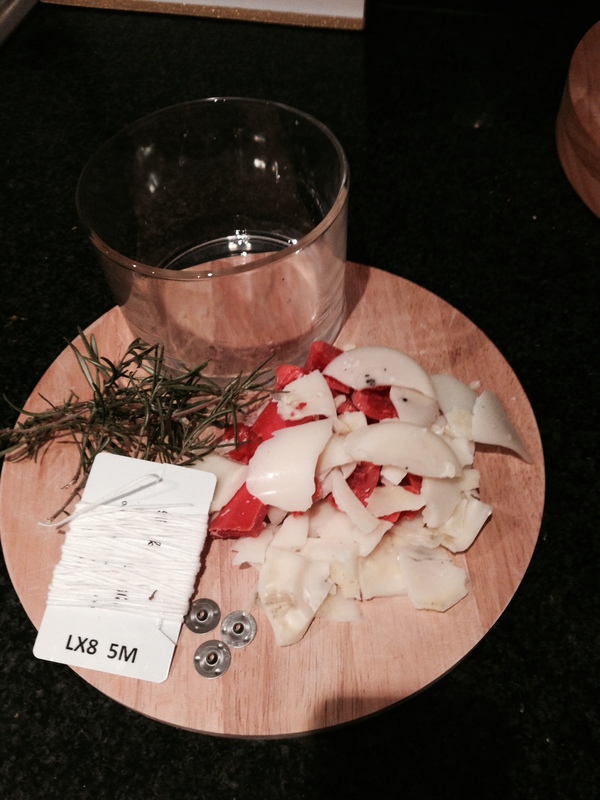 I then added in some rosemary – more for the look at the wax I used smelled delicious already – and poured the contents into the glass holder. 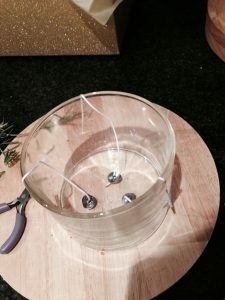 Pour it slowly and aim for the centre – the wax dries quickly when it hits the edges so you don’t want any waxy drip marks to try to neaten up later. 4 – Put your feet up! Leave the wax overnight and when you check on it you’ll have a wonderful homemade candle! Simply unstick the wicks from the side of the holder, snip them down (mine are probably a bit too long here) and light them up! 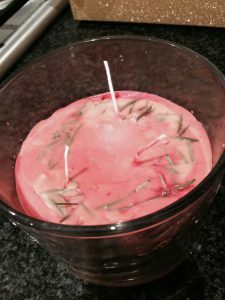 There you have it, a really quick simple and inexpensive way to use up your leftover wax while making a gorgeous DIY candle!